These healthy, low-fat vibrant Veggie Spring Rolls are fun to make and even better to eat! You can stick to the recipe exactly or experiment with other combinations of fruits, herbs and vegetables you love. You could even get your family or friends involved and make and enjoy these together. We hope you love them! 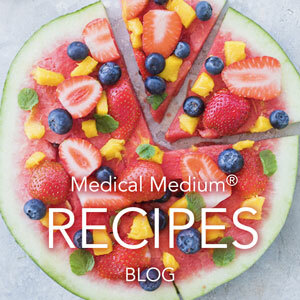 In this recipe, the cucumbers are allies to the liver due to their ability to hydrate it. Your liver’s always in need of living water that’s filled with minerals and other nutrients, because your liver keeps your blood hydrated. It relies on sources such as cucumber for that living water. This minimizes dirty blood syndrome by helping reduce fats and toxins inside of dirty blood. Phytochemical compounds in cucumbers act as anti-inflammatories to the small intestines and colon. Cucumbers have a gentle blood-thinning ability, too, allowing for detox to occur naturally, without obstruction. Radishes are another star ingredient in this recipe. They are a strong medicine for our livers. The pungent, biting nature of radishes comes from a compilation of chemical compounds, many of them undiscovered, that act as disinfectants to the liver, stopping pathogen infection and boosting the liver’s personalized immune system by increasing its white blood cells’ ability to fight and destroy invaders. Make the sauce by putting all the sauce ingredients in a bowl and whisking until smooth and combined. Add water to reach desired consistency. Pour into a serving bowl and set aside. To make the spring rolls, fill a bowl or pan big enough to fit the rice paper with warm water. Soak the rice paper in the water for about 30 seconds - until pliable but not soggy. Place the rice paper on a work surface and arrange the fillings on the 1/3 of the rice paper closest to you. Fold the left and right edges of the rice paper in, then starting from the bottom, roll up to cover the filling. Keep rolling firmly, the rice paper is sticky and will seal itself. Repeat with remaining ingredients. To serve, leave the rolls whole or cut them in half with a sharp knife. Sprinkle with sesame seeds (if using) and serve with the dipping sauce. 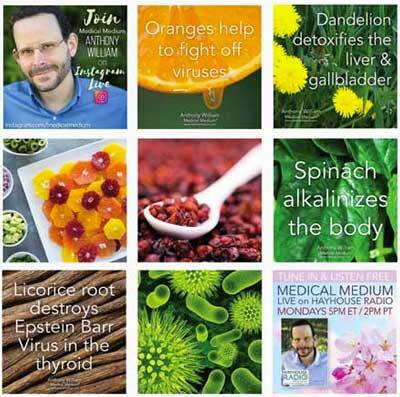 To find out more of the undiscovered healing properties of dozens of foods, check out the New York Times Best-selling book, Liver Rescue. Bring in the New Year with this lightly fizzy, refreshing Champagne Mocktail. The coconut water and lime juice not only gives this drink great flavor, but also offers critical hydration, glucose and minerals. Add the pomegranate seeds for a festive touch or skip them altogether. Coconut water has the ability to hydrate the body on a deep, cellular level making it an essential beverage for athletes and those that live a busy, active life. It also has been shown to help balance pH levels, boost the immune system, and support kidneys in filtering toxins and reducing the risk of kidney stones. Coconut water is also highly beneficial for cardiovascular health as it can help to reduce blood pressure and increase healthy circulation. It is also a vitally important drink for those who are suffering with a chronic illness such as migraines, sinusitis, COPD, fibromyalgia, asthma, PCOS, cardiomyopathy, crohn's disease, epilepsy, hypertension, multiple sclerosis, Parkinson’s disease, hypothyroidism, arthritis, lupus, and chronic fatigue syndrome. The antioxidant flavonoids in limes are another ally in fighting disease. And when you’re dealing with a cold, flu, bronchitis, or pneumonia, lemon is one of the most effective mucus expellers you can find. Limes are also amazing cleansers of the liver, kidneys, spleen, thyroid, and gallbladder. They purge the many toxic substances we collect from exposure to plastics, synthetic chemicals, radiation, and poor food choices. Combine the coconut water, sparkling water, lime juice and maple syrup in a jug. Mix well. Pour into champagne glasses and serve immediately with pomegranate seeds (if using) and lime slices. These sweet and gooey Banana Cinnamon Rolls taste like a truly decadent treat. But the best part is that they don’t contain any gluten, dairy, refined sugar, or other problematic ingredients so you can enjoy them in abundance knowing they are truly good for you! You can make this recipe in an oven or dehydrator. Either way, they’ll be delicious! The fructose in banana is the liver’s favorite source of food. It provides quick fuel to the liver and wakes up sleepy cells, increasing their ingenuity and work output. Soothes the linings of the intestinal tract and also soothes the nerves attached to the intestinal tract. Contrary to popular belief, bananas are one of the most antibacterial, anti-yeast, anti-fungal foods. A great food to combine with other nutrient-rich foods or to take with supplements, because they improve the liver’s ability to absorb nutrients. Preheat oven to 250F (or use a food dehydrator). Line a baking sheet with parchment paper. Slices bananas into 3 vertical pieces and arrange on baking sheet. Bake for 2 hours in the oven or 3-4 hours at 115F in the dehydrator, until you can roll them without breaking them. Make the date paste filling by combining dates, cinnamon, nutmeg, ginger, vanilla, salt and water in a food processor or blender and blending until smooth. Add a bit more water if needed. Set aside 1/2 cup for the date caramel. Once the bananas are cooked, let them cool for 15 minutes. Flip the banana slices over, then coat one side of the banana with the paste and roll up into a cinnamon roll. To make bigger rolls, roll an additional banana slice onto the roll. Place the cinnamon rolls back in the oven for 1.5 hours or in the dehydrator for 2-3 hours. Make the date caramel by whisking together the separated date caramel, water and nut butter (if using) until you get a smooth sauce. Drizzle on top of the cinnamon buns and sprinkle on chopped walnuts (optional). Best served immediately. There’s nothing like a creamy, delicious dip with a bright platter of veggies to provide a feast for the eyes and taste buds. This dairy-free queso dip is sure to please the crowds at your next party, or serve it up for an afterschool or work snack, or at your next family movie night. No matter when you choose to enjoy it, it’s sure to be a hit so you may want to double or quadruple the recipe! Potatoes are also high in potassium and rich in vitamin B6, as well as a fantastic source of amino acids, especially lysine in its bioactive form. Lysine is a powerful weapon against cancers, liver disease, inflammation, and the viruses such as Epstein-Barr and shingles that are behind rheumatoid arthritis, joint pain, autoimmune disease, and more. Potatoes will be your allies if you’re looking to fight any chronic illness—to fend off liver disease, strengthen your kidneys, soothe your nerves and digestive tract, and reverse Crohn’s, colitis, IBS, or peptic ulcers. Cashews are high in protein and are a rich source of vitamin B-complex and essential minerals such as iron, selenium, and zinc. They are also packed with anti-cancer compounds called proanthocyanidins that have the ability to starve tumors and stop cancer cells from dividing. Place the potato, water and sea salt in a small saucepan and bring to a boil. Cook, uncovered, for 10-15 minutes until the potato is soft. Drain the cooking liquid into a jug and set aside. Place the cooked potato in the jug of a blender and add the soaked cashews, lime juice, garlic powder, onion powder, ground cumin, jalapeño, smoked paprika, tomato paste and turmeric. Add 2/3 cup of the cooking liquid to the blender and blend the mixture until very smooth. Add a bit more liquid if needed. Taste and adjust seasoning. Pour into serving dish and top with a few slices of fresh jalapeño, diced tomatoes and cilantro. Serve with corn-free tortilla chips and vegetable sticks. If you grew up loving Rice Crispy Treats, this recipe is bound to ignite some fond nostalgia. But with this gluten-free, dairy-free recipe, you can know the ingredients are as clean as it gets for a Rice Crispy Treat, without sacrificing any flavor. The combination of sweet raw honey with creamy cashew butter makes a truly delicious coating for the puffed rice. You may find these go very fast! Raw honey is also great for digestion as it contains probiotics that help to keep the beneficial bacteria in the gut healthy and strong. Raw honey also functions as an expectorant and is known to benefit respiratory conditions such as bronchitis and asthma. Raw honey promotes restorative sleep and can aid in healing and rebuilding the body during the night. Combine raw honey, cashew butter, vanilla and salt in a large bowl. Stir well. Add the brown rice cereal and mix with a spatula until combined. Line a 9x9 baking dish with parchment paper and pour mixture into the dish. Press down with the spatula to smooth everything out, then place the dish in the refrigerator. Refrigerate for at least 1 hour, until the bars have hardened, then remove and cut into bars. Best kept in the fridge. Nothing quite hits the spot and soothes the soul like a warm drink on a cold day (or anytime of year!). Add in the incredible medicinal properties of Chaga mushroom and some special healing spices, and you have yourself a deeply therapeutic and delicious drink to enjoy. This recipe would be wonderful to serve to friends and family or to savor on a quiet morning or evening alone. Chaga is one of the best sources of betulinic acid, which is known to kill cancer cells on contact. Chaga is therefore often listed as one of the top anti-cancer and anti-tumor foods and is highly valued in a variety of natural cancer treatments and preventative protocols. Research has shown Chaga to be particularly beneficial for colon, stomach, endometrial, lung, breast, and prostate cancer. Chaga is also rich in beta-glucans, which can dramatically strengthen and reinforce the immune system making it an ideal choice for those suffering with autoimmune disorders such as chronic fatigue syndrome, rheumatoid arthritis, lupus, fibromyalgia, irritable bowl syndrome, Crohn’s disease, lymphoma, bursitis, shingles, and PCOS. Chaga contains the highest level of superoxide dismutase (SOD) in the world, which is an enzyme that promotes the breakdown of free radicals and has been shown to be highly effective in the treatment of Parkinson’s disease, Alzheimer’s, Lou Gehrig’s disease, gout, scleroderma, osteoarthritis, and cataracts. Its anti-inflammatory properties makes it ideal for those with IBS, arthritis, colitis, cystitis, tendonitis, edema, asthma, celiac disease, and acne. The wide range of healing benefits found in Chaga makes its one of the most important and essential medicinal foods to be included in one’s natural health regime. Place the coconut milk, water, chaga powder, cinnamon, ginger, cardamom, nutmeg, dates and vanilla in a blender and blend until smooth and frothy, for at least 2 minutes. To make the optional coconut whip, chill your mixing bowl in the freezer for 10 minutes. When the bowl is chilled, remove the thick cream from the top of the can, leaving the coconut water behind. Using an electric whisk, beat the cream for 2-3 minutes until you get soft peaks. Add the honey and beat for another 2 minutes. To serve, pour the latte into a cup and top with coconut whip (if using) and a sprinkle of cinnamon. Serve immediately. The classic combination of broccoli and cheese is a winner all on its own. Place it inside a crispy pocket made from potato and you’ve got a mouth watering new way of enjoying this common favorite. 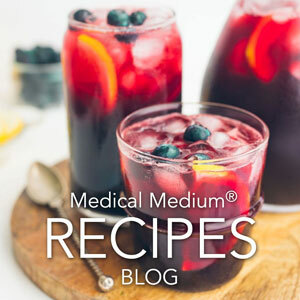 What makes this recipe really unique is that its made of truly healthy and healing ingredients. There’s no cheese, milk, gluten, or butter. It’s even fat free, which makes it an ideal snack or meal for anyone trying to support their liver, which is an integral part of healing from chronic illnesses and symptoms. Broccoli is highly beneficial for the nervous system and is known to ease migraines, hypertension, anxiety, and nervous ticks. It contains natural antihistamine properties and is fantastic for warding off seasonal allergies, watery eyes, sinusitis, sinus infections, colds, flu, and bronchitis. Broccoli is well known for its ability to protect against heart disease and reduce the risk of atherosclerosis, strokes, and heart attacks. In a large pot fitted with a steaming basket, add the potatoes and carrots. Add a few inches of water and steam until soft, about 45 minutes to 1 hour. Remove and cool for 10-15 minutes, until cool enough to handle. Remove one potato and one carrot from the pot and set aside for the cheese sauce. Place the remaining potatoes in a large, flat-bottomed bowl or pot and mash until they are broken down. Add the potato starch, tapioca flour and oregano and mash until the flour and starch are well combined. If the mixture is very dry, add a bit of warm water. If the mixture is very wet, add a bit more tapioca flour. The dough should be pliable and not stick to your fingers. Set aside while you make the filling. Place the left-over potato and carrot in a small food processor or blender and add the turmeric, garlic powder, cayenne, lemon juice, sea salt, black pepper and water/vegetable stock. Blend until smooth. Add a bit more liquid if necessary, then set aside. Steam the chopped broccoli until cooked. Remove and add to bowl. Add the lemon juice and season with sea salt. To make the pockets, take a handful of the potato mixture and roll it into a ball. Flatten the sides out so that there is a cavity in the middle, then add a couple teaspoons of the cheese sauce and broccoli. Close the pocket gently and smooth out any creases. Repeat with remaining dough. Add the pockets on a ceramic nonstick pan and cook for 5-10 minutes on either side, until browned and crispy. You can bake them in the oven at 350F for an additional 20 minutes if you want them even more crispy.